For those not familiar, a kugel is the Jewish term for a bread pudding. Except kugel traditionally uses an egg noodle. But it is often hard to find gluten free egg noodle all year round. With the launch of Catelli's new gluten free ready to bake lasagne noodle, I thought this was the perfect opportunity to put Catelli's noodles to the test. Catelli's gluten free pastas are made from a unique four-grain blend of white rice, brown rice, corn and quinoa. Catelli's gluten free pastas are available in Spaghetti, Fusilli, Penne and Macaroni, and new Lasagne and Linguine. Catelli's Fusilli gluten free pasta has already become one of our favourite pasta's to use because its been easy to make and has been able to hold up well for lunches the next day. You can learn more about Catelli at www.catelli.ca. So, why a lasagne noodle in place of an egg noodles? Egg noodles are usually wide, and a lasagne noodle can pretty much be cut to any width. 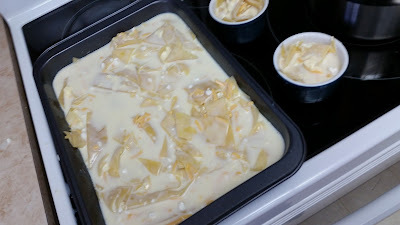 So off I went experimenting with a family recipe to make a sweet kugel. Ignore the instructions on the box, because we aren't going to cook these like we would a lasagne. After all, we are innovating here. Fill a pot up with hot water and lay the noodles down to soak for 10 minutes or so to get a little soft so you can cut them. To be sure the noodles don't clump together to much, stir them around every couple minutes. Mix in the rest of the ingredients except for the bread crumbs and cinnamon. After the mix is complete, it should be time to get the noodles ready. The noodles will be starchy, but that's okay. Take the noodles out and cut them the best you can into strips. You don't have to be perfect, because this is a pudding style meal anyways. You can grab a bunch of noodles and slice them all at once if it makes it easier. Just be sure to separate the stacked noodles. 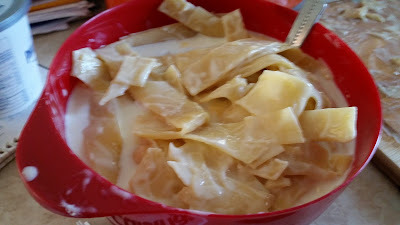 Mix the cut up noodles, and cheese mix together, ensuring the noodles are drowning in the mix. Preheat oven to 350 degrees to get ready for baking. This meal can be prepared two ways. In ramekins or in a large baking dish. We tested both successfully. This meal can also be prepared then frozen for a later date because the gluten free Catelli noodles hold up really well for this recipe. Grease a 9 x 13 inch baking dish or ramekin's. 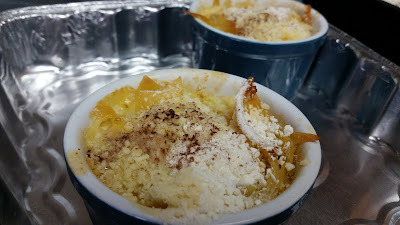 If using a ramekin, pull noodle out of mix and place in ramekin, then poor mix over covering the noodle in the ramekin. It's okay to have some of the noodle exposed. If using baking dish, poor the entire mix in and evenly spread the noodles. 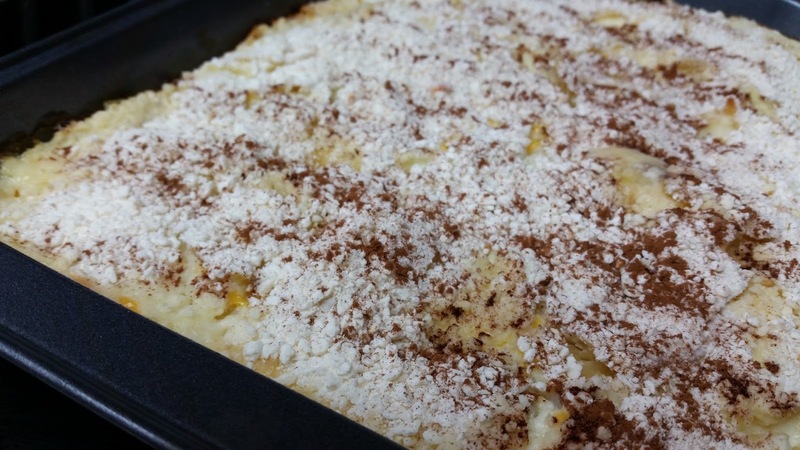 Top with bread crumbs and cinnamon. Place in oven for 1 hour or until golden brown.